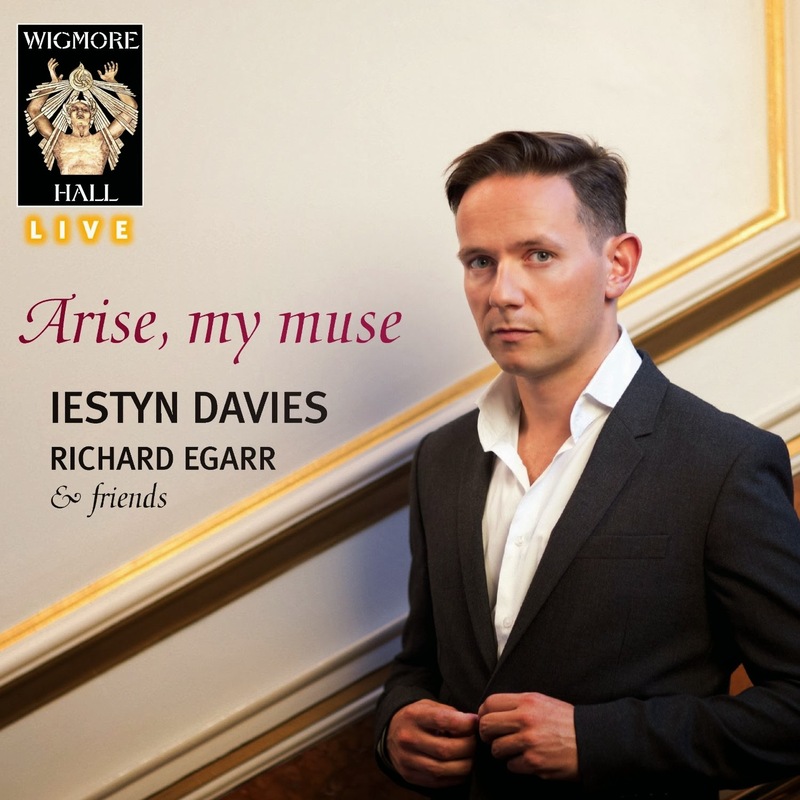 This latest disc on the Wigmore Hall Live label records Iestyn Davies's 27 February 2013 concert at the Wigmore Hall when the counter-tenor was joined by Richard Egarr and a small baroque instrumental ensemble for a programme of music by Henry Purcell and his contemporaries, Jeremiah Clarke, John Blow and William Croft. Davies is joined by Richard Egarr on harpsichord, Pamela Thorby and Tabea Debus on recorders, Bojan Cicic and Stephen Pedder on violin, Julia Kuhn on viola and violin, Mark Levy on viola da gamba and William Carder on theorbo and baroque guitar. The disc opens with a group of airs from Purcell's odes and welcome songs large scale pieces written for particular (often Royal) occasions. Arise my Muse come from Purcell's 1690 Ode for Queen Mary's Birthday, in fact the extract is a dramatic recitative which Davies declaims with admirable line and flexibility. The instrumental ensemble provides superb accompaniment. Strike the Viol is from Come ye songs of Art, away which Purcell wrote in 1694, the last of his birthday odes for Queen Mary (she died of small pox the same year). Davies and Egarr take the piece at quite a lively tempo, bringing out the piece's dance rhythms. The result is highly infectious with Davies providing some lovely divisions and a pair of recorders adding beautifully to the mix. Here the Deities approve is from the 1683 ode for St Cecilia's Day, Welcome to All the Pleasures. The tempo here is quite stately, but the piece is still very much a dance. Davies gives us a superb combination of line and words with the voice and instruments acting as equal partners. And there is striking instrumental postlude. The Pale and the Purple Rose is from the 1689 Yorkshire Feast Song (yes, a feast for Yorkshire worthies living in London!) and is a nicely rhythmic dance with a long instrumental introduction. The high recorders and violin contrast with the flexible vocal line and again Davies gives us some finely even divisions. For the first instrumental interlude we skip over to Italy for Giovanni Gabrieli's Sonata XXI played by three violins, harpsichord and theorbo. The sonata was published in 1615 and was influential in the development of the sonata in Northern countries. We have three wonderful intertwining violin lines supported by an underlying rhythmic structure which again brings out the dance elements. Tis Nature's Voice is from Purcell's most ambitious and grand ode for St Cecilia's Day, the 1692 Hail Bright Cecilia. Davies sings the arioso flexibly, with expressive divisions and fine words, plus some lovely sighing and panting later on in the piece. Crown the Altar from the 1693 birthday ode for Queen Mary has a nicely free vocal line over a more rhythmic accompaniment. By contrast If music be the food of love is a rather structured song with quite a catchy tune. Davies and Egarr perform the first version of Purcell's first setting of the words, with Davies singing with a fluid and fluent line. The final work in this Purcell group is his fantasia Three Parts on a Ground which may be his earliest surving ground bass composition dating from the 1670's. It is quite a perky piece with three lines intermingling and contrasting. The players get a feeling of steady progression and developing complication in the work. Jeremiah Clarke was the master of the choristers at St. Paul's Cathedral; he had started out as a chorister in the Chapel Royal, going on to first becoming the organist of Winchester College. It was whilst at Winchester that Clarke wrote Come Come along for a dance and a song, a very grand ode written in memory of Purcell from which comes the lament The Glory of the Arcadian Groves. It is quite a Purcellian piece in rather a regular metre, but with a lovely vocal line complemented with some expressive recorders. John Blow was senior to Purcell. Purcell succeeded him as organist at Westminster Abbey, with the older man resuming the post on Purcell's death. Blow's anthology Amphion Anglicus was published in 1700; it is a selection of 50 of Blow's finest setting of English verse and from it comes Poor Celadon, he sighs in vain. A slow poignant piece with a highly affecting, slowly unfolding vocal line. William Croft was a former pupil of Blow and eventually became master of the choristers and organist at Westminster Abbey in succession to Blow. Ye Tuneful Numbers is described by Croft as a song with symphonies. It opens with a symphony and then follows a sequence of airs and recitative. The symphony is a stylish, rather toe-tapping piece, followed by the air Ye Tuneful Numbers which is quite formal but with a free flowing vocal line which does not seem highly structured. The second air Tell her I'm wounded has two intertwining violins in dialogue with the voice. The airs moderate tempo allows Davies to give us some lovely expressive divisions. A short recitative leads to the rather perky final air When Thousands more, the same music share. John Blow's opera Venus and Adonis was written for performance at Court between 1681 and 1683. In the earliest surviving manuscript it is described as a masque, and French inspired dance seems to have been an important component of the music. The work was clearly a model for Purcell's Dido and Aeneas and the fact that we now know that both works were performed at Josiah Priest's school for young ladies gives us an intriguing link between the two works. Egarr and his musicians give a lively suite of dances from the opera, providing crisp characterful playing that keeps the sense of the dance ever present. The final item is Purcell's lovely song O Solitude, sung by Davies with fine attention to both the words and the nicely flowing vocal line, full of expressive fluidity. The audience was treated to an encore, and so are we, with Fairest Isle from King Arthur. The recording captures Davies's voice well, particularly the way he and the instrumental group interact as equals. There is a lovely focussed quality to Davies's stylish, expressive and poised singing. All Purcell's vocal music needs great attention paying to the words, and Davies's diction is superb throughout giving us just the right combination of music and poetry. The CD booklet includes full words as well as an extensive article about the music. If you like vocal music or are an admirer of Purcell's art then I cannot recommend this disc too highly. The live recording has clearly captured a very special occasion and as selection of 17th century airs go, this collection can hardly be beaten.